He loves to just hang out on the couch next to me while I blog. And he’s not going anywhere. This is a good stage; his personality is emerging, but there’s no mobility yet. I say this because I took him to a playgroup of local moms today and Jack was the youngest baby by at least a year. All the other kids were crawling and/or walking… and oh my god, I was exhausted just watching. So, Jack, NO RUSH on that. I’ll just carry you around forever. Would it be weird to have a 3 year old in the Baby Bjorn? Anyway. Jack was a rockstar last night and slept from 9-7:45. Thanks, kiddo. 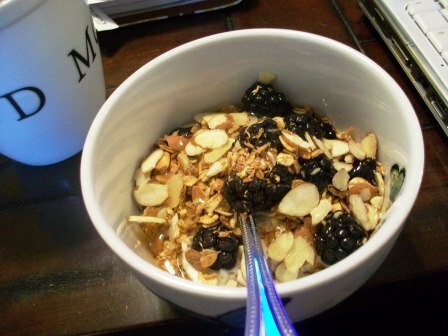 Breakfast = Greek yogurt (Brown Cow) topped with fresh blackberries, granola, sliced almonds and honey. After breakfast I Shredded and then we headed to Babies R Us. Jack is outgrowing all of his PJ’s so we stocked up on those, along with a few other necessities (one polo, two pairs of shorts, two pairs of sweatpants, sandals, swim shirt, swim trunks…). Babies R Us had all of this random stuff on clearance. I found my Aveeno face moisturizer for $2.98- it’s usually $10. They also had a bunch of Neutrogena cleansers and moisturizers on sale for under $2, so if you use those it might be worth a trip. Then home for lunch. Last night I threw together a big salad to portion out for lunches throughout the week. 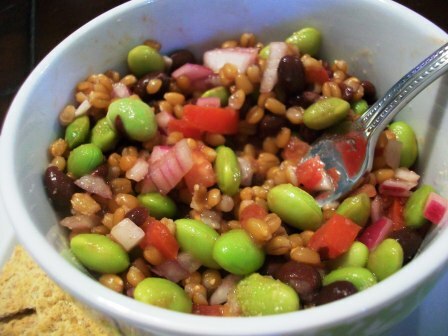 The recipe is from an olive oil ad (LOL), and it’s basically just wheatberries (love them), black beans, edamame, chopped red onion, chopped tomato, olive oil, red wine vinegar and kosher salt. Easy and super filling. I might add some cumin, garlic salt and fresh parsley to kick it up a bit. Along with some Kashi TLC Multigrain Crackers. This is NOT the most elegant recipe, but it’s true comfort food and insanely easy to make. It was kind of salty so next time I might use the reduced-sodium cream of mushroom soup and maybe half of the french onion packet. 1. Cube the chicken breasts and place in bottom of slow cooker. 2. 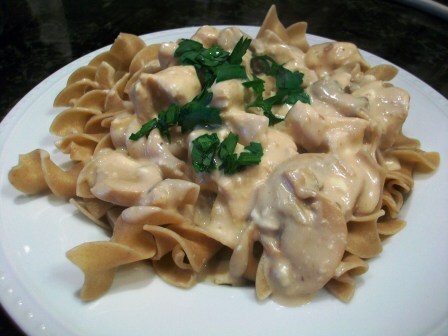 Mix soup, mushrooms, sour cream, dry soup mix and chicken broth in a large bowl. Pour mixture over chicken cubes. 3. Cut the Neufchatel into chunks and sprinkle on top of soup mixture. 4. Cook in slow cooker on high for 3 1/2 hours. Stir to blend and serve over noodles. Also on the menu? 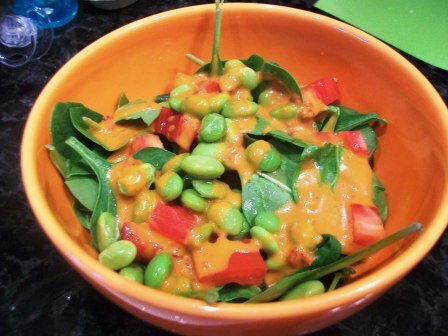 Baby spinach topped with chopped Roma tomato and edamame- drizzled with Annie’s Woodstock. What websites are you loving right now? I recently found StartCooking.com. It’s awesome- they give step-by-step instructions (with photos!) for preparing pretty much anything, from frying an egg to cooking risotto. ALSO, the sweetest blog I’ve found in a while: Enjoying the Small Things (be sure to start here). You’ll cry- in a good way. The photos are gorgeous and every time I read one of her entries, I just want to hug Jack… and then dress him in a really cute outfit. 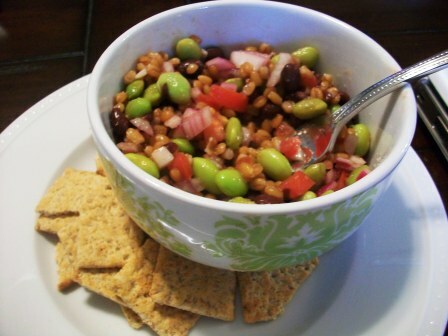 This entry was posted in April 2010 and tagged Chicken, Jack, Recipes, slow cooker, wheatberries. Bookmark the permalink. Loved this post. I also have to thank you so, so much for the introduction to Enjoying the Small Things. I’ve been reading it for the past hour. Incredible – and such beauty inside and out. I LOVE your web site! My husband is really going to enjoy eating that endamame salad! Thanks for the two thumbs up on my website! My 60 videos and 250 photo-tutorials cover the basics in cooking plus I have tons of fast and easy recipes as well. NoblePig.com is my new favorite website. Their (baked!) mini crab cakes are fabulous! That salad looks amazing– I am definitely going to try it asap Also, thank you so much for introducing us to “Enjoying the Small Things”. This story absolutely touched my heart, and has had me crying (in a good way) in my office (meh… which might not be so good…) I’ve gotten some really fabulous blog recommendations through you (also Nie Nie Dialogues!) — so keep ‘em coming as you find them Thanks again! Jack sure is growing up, sleeping in, woo hoo! I am loving all the food blogs that I have found, including yours! Love this post…always looking for new ways to use edamame. Jack looks so cute! 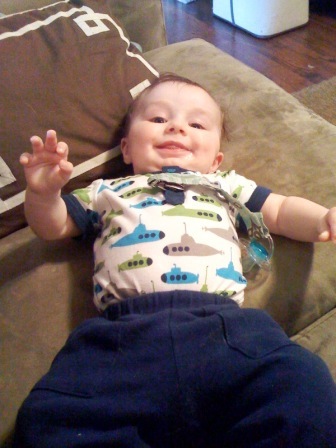 Where did you get that adorable submarine onesie? Mobility definitely keeps you on your toes! I agree, Cordelia is not allowed to grow up. But it is fun when they can talk b/c they say the cutest things.